Increasing numbers of the oldest people in Britain are living alone, according to official statistics. Experts say that the "oldest old" - those over 85 - are the fastest growing age group in Britain. There are now 1.1 million people over the age of 85 in the UK - but the number living in care or nursing homes has fallen as the population has grown. The report came as a charity claimed television is the main source of company for nearly half of pensioners. According to the Office for National Statistics, the number of the "oldest old" rose by 84% between 1981 and 2004. But the research also found that increasing numbers were likely to live alone. The oldest women were more likely to be living alone than the oldest men, largely because women tend to live longer than their husbands. Between the early 1980s and the turn of the century, the number of oldest men living alone jumped to almost half of all those over 85. At the same time, the number of women over 85 living alone reached 69%. Research found that while some over-85s without a spouse lived with friends or family, the proportion had dropped over the last two decades. Those most likely to be living with family had long-standing illnesses. In a separate survey, charity Help the Aged said its research suggested television was the main source of company for nearly half of all over-65s. 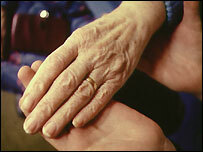 In a survey of 1,018 over-65s, the charity found that more than half did not see their family more than once a month. The survey found the more than a third of over-65s wanted more visits from grandchildren, with 8% saying they only saw them once every six months. But more than half said they did not want to ask for this, out of fear of "pestering" their family. Paul Cann, policy director at Help the Aged, said: "These depressing findings raise some tough questions. Are we going to stand by as lonely and isolated older people are left with the television as their main form of company? "Or are we going to ensure that they have the means and practical help to continue to live full lives and enjoy the company of family and friends?"